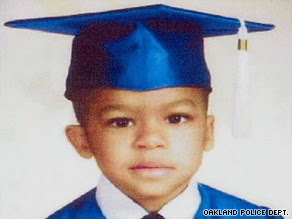 Some of you may have heard about Hassani Campbell, the missing five-year-old boy with cerebral palsy from Oakland, California. The story has been haunting me. His beautiful face has been haunting me. Jo has a really smart post today about media bias toward cerebral palsy. She notes that the press has told the public to look for a little boy with metal braces on his legs, but points out that SMO braces (the kind Hassani has) are not visible with shoes, and that kids with these braces often walk just like any other kid. So people would think they should be looking for a child with a noticeable limp and noticeable braces, when, in fact, Hassani looks like any other kid. This bias is so prevalent. When I tell people that Max has cerebral palsy, many automatically assume he is in a wheelchair. I have to help them understand that cerebral palsy comes in many forms. Max's legs are the least affected part of his body; his arms, oral-motor skills and cognition are the most affected. Conversely, there is a boy in Max's school who is completely wheelchair bound but who is brilliant. Tonight, I am thinking of Hassani, and praying for his safe return. Ellen, that story has been haunting me for the past week. I'm so worried that the general public's misconceptions when it comes to CP may be holding back the search even more. I was talking about it to a woman today who said that there was no way Hassani could have wandered off because children with CP CAN'T WALK! Imagine if she were the one to see Hassani out somewhere, and she didn't recognize him because he's not in a wheelchair? I hope and pray that Hassani is found safely. What a terrible story. His family must be devastated. There is nothing worse than losing a child, not knowing where your baby is or if they're safe. No mother should have to endure that pain. No family should have to be put through that. He needs to be found NOW. As time passes, the likelihood of recovery dims--it's a sad fact of these cases. My.worst.fear. and it has not diminished even when he went to college. Hoping this child is returned to his family. We are in sync today, Ellen, as I have a post on a media representation of children with disabilities. I'll keep him in my prayers, too. Were you traumatized by the NICU? How are your kids like you? Developmental problem or just an every-kid quirk? Ever feel like life is zooming by at 90 mph?